Hylacross™ technology uses the original cross linking using 100% high molecular weight HA. Products in this range include Juvederm® Ultra (Juvederm® Ultra 2, Juvederm® Ultra 3 and Juvederm® Ultra 4) and Ultra Plus range. At Bedford Skin Clinic we use the Juvederm® product range specially designed for different purposes and effects, from eliminating tiny lines to enhancing facial contours and sculpting lips to perfection. 1. Juvederm® Ultra 3, Juvederm® Ultra 4 and Juvederm® Volift for wrinkle correction, nasolabial folds (smile lines) and lip augmentation. 2. 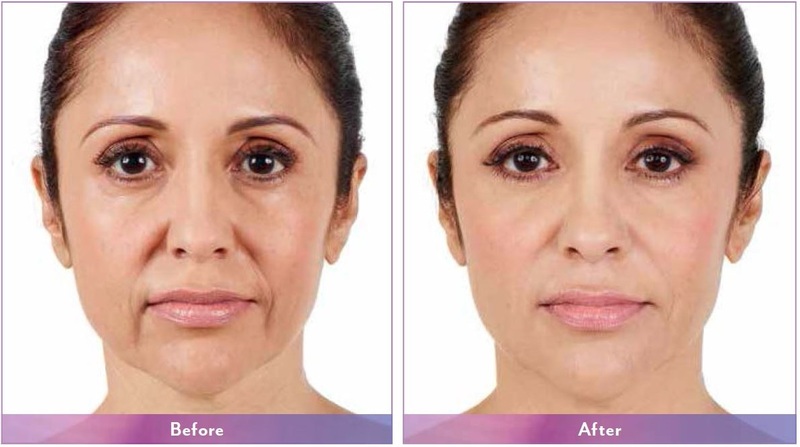 Juvederm® Ultra 2 and Juvederm® Volbella for fine lines such as forehead lines and smoker’s lines. 3. Juvederm® Volite for hydrating the face, neck, hands, décolletage and the other body parts. This gives you a brighter and youthful appearance. 4. Juvederm® Voluma for cheek and chin augmentation, jaw line definition and volume restoration of the face. For optimal results combinations of products may be required. At Bedford Skin Clinic the doctor will choose the product that matches the tissue structure at various levels of skin depth. This depends on many factors, such as your age, skin type, life style and muscle activity as well as on the injection technique. The gel particles in Juvederm® are absorbed so slowly that you have ample time for maintenance treatments. As the gel breaks down, water takes its place. The less concentrated the gel becomes, the more water it is able to bind. These facts are the main reasons that treatments with Juvederm® products last long. When totally absorbed the gel disappears unnoticed from the body. Most patients require follow-up treatment six to twelve months after an initial treatment of wrinkles or facial contouring. After lip treatments, a top-up treatment may be required in 3 -6 months. Immediately after the treatment, you can expect a slight redness, swelling, tenderness and an itching sensation in the treated area. This is a normal result of the injection. The discomfort is temporary and generally disappears in a few days. When it comes to lip augmentation, the swelling may last longer. Some patients experience swelling for about a week. During this time, the lips can look somewhat uneven. This means that the result directly after the treatment should not be regarded as the final result. If the discomfort continues or if other reactions occur, you should always contact us. A touch-up treatment within 2-4 weeks after the initial treatment may be necessary to achieve an optimal correction. After the treatment some common injection-related reactions may occur, such as swelling, redness, pain, itching, discoloration and tenderness at the injection site. These typically resolve spontaneously within a few days after injection into the skin and within a week after the injection into the lips. Other types of reactions are very rare, but about 1 in 2000 treated patients have experienced localized reactions thought to be of a hypersensitive nature. These have usually consisted of swelling at the injection site, sometimes affecting the surrounding tissues. Redness, tenderness and rarely acne-like formations have also been reported. These reactions have either started a few days after the injection or after a delay of two to four weeks and have generally been described as mild to moderate and self-limiting with an average duration of two weeks.